Storage: Keep in a cool and dry place. Consume it soon or keep in fridge after unpacked. 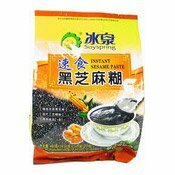 Ingredients: Black Sesame (45%), Black Rice (25%), Sugar, Maltose, Water. Simply enter your details below and we will send you an e-mail when “Instant Black Sesame Paste (12 Sachets) (芝麻糊)” is back in stock!